As a junior athlete, I was always in awe of the likes of Michaela Gigon and Christine Schaffner. Between the two of them, for many years they held World Ranking positions 1 and 2. Even though MTBO was still a young sport, they had already achieved so much with countless World Championship gold medals. I was privileged to be able to head to the Denmark TC in 2009 with the Austrians, and then to Italy for a week that same year. Although only two weeks, I learnt so much; from physical training, to technical skills (I learnt to track stand), and even about race preparation. Above all, I got to see them as humans, rather than MTBO Goddesses, that didn’t just live, breathe and sleep MTBO. Over the last few years, I’ve consistently been near the top end of the results list. 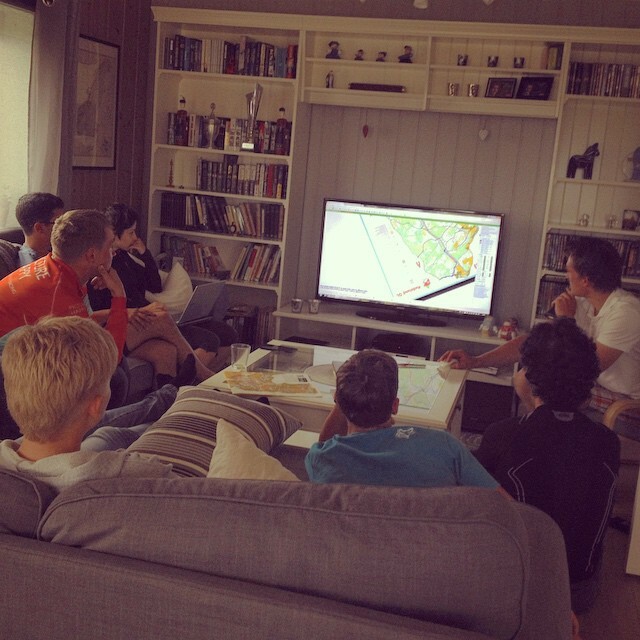 I’ve started to see that there are huge development opportunities for many MTBO athletes. It is well known that most national federations don’t really support MTBO. Sure, they send a team to major races, but outside of that there is little in the way of coaching opportunities, especially in small nations. With few training weekends (and that’s the handful of nations that hold national team training), most athletes are left in the dark, without access to coaching or training maps made for MTBO. I was lucky in my early career that I had 4 years of FootO coaching with the GB Start Squad and several international competitions under my belt. When I started MTBO, any support I had disappeared. I tried to use my knowledge to coach myself. By the same token, I was unlucky having had this experience. I kept doing things ‘the FootO way in Britain’. It took me 5 years to shake those bad habits I picked up in my FootO days, because I didn’t even know they were bad habits! I have many athletes who email me or contact me through Facebook asking for tips or advice. I felt I could help, and offered the MTBO community a chance to join us, BenhamKvåle in Norway for an intensive training camp. In week, I hoped to cover the basics of physical training, MTBO training, and help those who could make the journey north in the areas they needed. 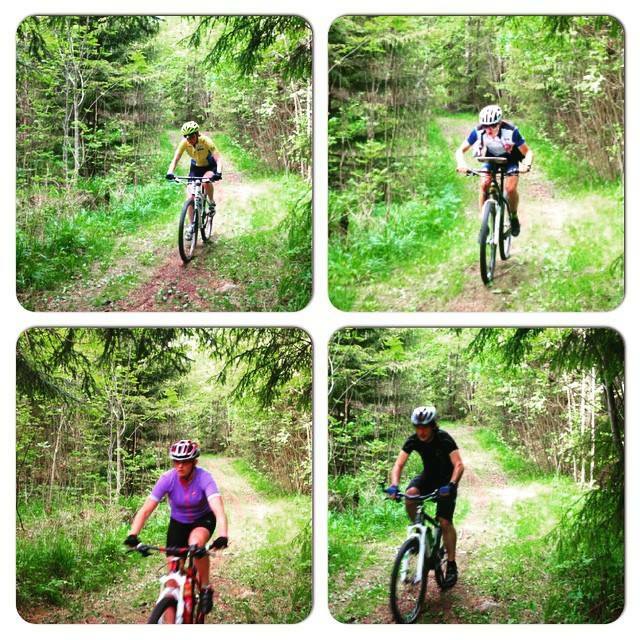 Finally, a chance to share the amazing forests and trails here with others who have the same interest – riding a bike! Deniz and Banu in Hønefoss on the first MTBO training day. 7 athletes were invited: 3 from Turkey, 2 from Sweden, and 1 each from Latvia and Czech Republic. Covering a range of ages and abilities, all are eager to improve and keen for all the information they can get in a week! Amongst the group are a Junior World Champion, European Junior medalist, and national champions. Each athlete is after different information and skills. Those less experienced in MTBO are improving rapidly having spent some days working on basic MTBO techniques such as attack points, control flow, planning ahead and speed changes. They’re dreaming MTBO in their sleep, which is no surprise with up to 5 hours orienteering on each of the two technical skills days so far! Others are after race prep info, warm up strategies, and mental techniques to control nerves. Some are just looking for methods to have better mental control, while a few need physical training advice. It’s a brilliant group. We’ve eaten national dishes from each of the nations here, and despite the hard training days, everyone is smiling. Admittedly they are heading to bed earlier and earlier! 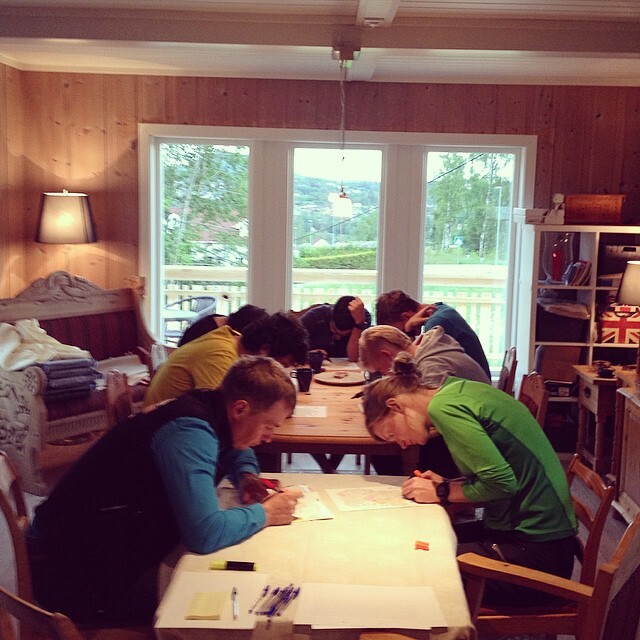 Thursday was the first training day, where we headed south to Hønefoss and spent the day in the forest. We covered the basics on this day; control flow, planning ahead, map memory, and even talk-O in pairs. There was something for everyone to learn, about themselves and about the navigation styles of their peers. It’s been drilled into these athletes *never stop at the control*! Through planning ahead, and always knowing their control exit, these riders will never need to stop in the circle again!! Basic techniques, but without access to coaching at home, they’re skills that can be ignored. On Friday, everyone rode my MTB time trial circuit. 11km in the terrain, with a bit of everything. Uphill, downhill, flat, technical sections. The afternoon was independent training, while I drove two guys up to my club’s FootO event: Had-O-land. It was a forested sprint race, and I drew the map, but I impressed myself my running the whole course. Even better, no achey legs the next day! Time trial analysis with 2d rerun. 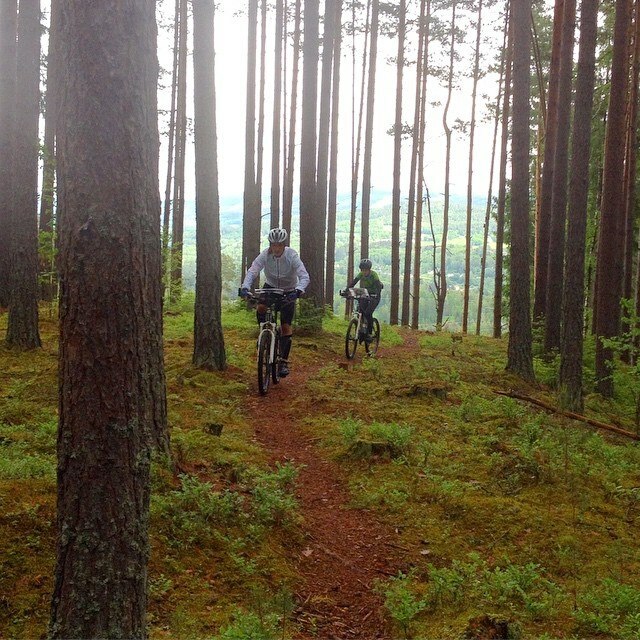 Saturday saw an intensive MTBO day in Jevnaker on my stolpejakt-map-turned-MTBO-map. Mixing it up, we had 3 short urban courses, where the athletes had to verbalise their plan in detail to a partner, before executing it. Having spent followed the Turkish riders on Thursday and witnessed stopping and discussions at EVERY junction, I worked with them individually on these ‘route description’ courses. In the space of a day, they had gone from having little trust in themselves, to picking out important key details and being able to ride without hesitating to the controls. I was really impressed. Verbalising in advance their plan, really helped, and suddenly all three made rapid improvements. Other courses in the morning involved a control pick, corridor and a longer course. After a break for lunch, we had courses on the other side of the bridge at Bergerfoss, in the beautiful Mosmoen forest. Here the athletes had two courses: attack points and speed changes. The attack points course had the attack points already marked on map, which really seemed to help many of the less confident riders, as they were able to bike fast until they hit the key feature. It wasn’t always a track though, some were using powerlines, field boundaries, path bends, vegetation changes and major junctions. The speed changes also proved useful, but highlighting to the riders that slowing the speed for technical controls/junction complexes is a good thing to prevent mistakes and hesitations. Finally, we’re up to Sunday’s training. With two shorter sessions of 60-90 mins each, it was something of a rest day. Only it wasn’t because I introduced the riders to maximum effort 5 minute intervals, and then followed it up in the afternoon with some mass start training around the local school grounds. The mass start training consisted of 8 intervals of 220-240m each with two controls per course! It was short, sweet and a lot of fun! After two or three starts, everyone got the hang of the fastest map-in-board-on-bike method for them. The session was completed with some bike mounts and dismounts, and track stand skills. Intervals. Go hard or go home. This entry was posted in MTBO, MTBO Training, MTBO Training camp. Bookmark the permalink.